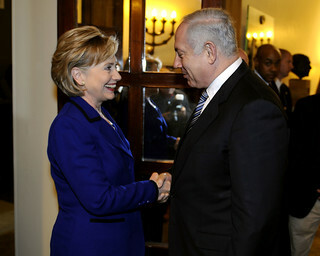 Hillary Clinton has put out another letter condemning the Boycott, Divestment and Sanctions movement (BDS) as a form of anti-semitism, on the eve of a Methodist General Conference that will consider measures to divest from three companies that do business in the occupied West Bank, Motorola, Hewlett Packard and Caterpillar. "The Jewish state is a modern day miracle -- a vibrant bloom in the middle of a desert -- and we must nurture and protect it. "Fighting for Israel isn't just about policy; it is a personal commitment to the friendship between our peoples and our vision for peace and security. Particularly at a time when anti-Semitism is on the rise across the world, we need to repudiate forceful efforts to malign and undermine Israel and the Jewish people. Anti-Semitism has no place in any civilized society -- not in America, not in Europe, not anywhere. We must never tire in defending Israel's legitimacy, expanding security and economic ties, and taking our alliance to the next level." The letter is addressed to David Stern, chair of the Israel Action Network, and Susan Stern vice chair of the Jewish Federations of North America. Again: reflect that the measures at hand are to divest from companies serving an illegal occupation that has gone on for nearly 50 years. Not sure what this has to do with the desert blooming. Clinton has repeatedly affirmed her opposition to BDS on the campaign trail, lately in a speech to AIPAC that also characterized BDS as a form of anti-Semitism. (Our view is that this is absurd and wrong.) Last summer she promised megadonor Haim Saban that she would work with Republicans to fight BDS. Obviously, donors play an important role on this question. Hillary Clinton needs Jewish pro-Israel money. The statement was promptly hailed by the Jewish Federations. "Thank you for your letter, and for your organizations' continued leadership in confronting so many of the important issues and challenges our world faces. "More than three decades ago, my husband, Bill, and I took our first trip to Israel, walked the ancient streets of Jerusalem's Old City, and fell in love with the country and its people. Israel became a special place for us, and I am lucky to have had many opportunities to return and to make many dear friends there over the years. "As Senator and Secretary of State, I saw how crucial it is for America to defend Israel at every turn. I have opposed dozens of anti-Israel resolutions at the UN, the Human Rights Council, and other international organizations. I condemned the biased Goldstone Report, making it clear that Israel must be allowed to defend itself like any other country. And I made sure the United States blocked Palestinian attempts at the UN to unilaterally declare statehood. Time after time, no matter the venue, I have made it clear that America will always stand up for Israel. If I am fortunate enough to be elected president, the United States will reaffirm we have a strong and enduring national interest in Israel's security. "It is because of my longstanding commitment to the Israeli people and to the security of Israel that I am writing to express my opposition to the Boycott, Divestment, and Sanction movement, or "BDS," the global effort to isolate the State of Israel by ending commercial and academic exchanges. I know you agree that we need to make countering BDS a priority, and that we need to work together -- across party lines and with a diverse array of voices -- to reverse this trend with information and advocacy, and fight back against further attempts to isolate and delegitimize Israel. It would be a serious mistake for the United States to abandon our responsibilities, or cede the mantle of leadership for global peace and security to anyone else. The Jewish state is a modern day miracle -- a vibrant bloom in the middle of a desert -- and we must nurture and protect it.